Featuring the latest APA-style guidelines, this concise guide helps readers master the skills and conventions they need to write well in psychology. This brief guide takes readers step-by-step through the writing process. In addition, it presents thorough discussions of researching psychological literature, focusing on online and database research, and presenting those findings in written and oral formats. Special attention is given to interpreting and reporting the results of statistical tests, as well as preparing data displays in tables and figures. 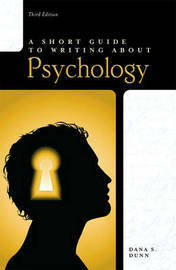 Introducing readers to all elements of professional writing in APA style, this book is a perfect supplement for courses in the social science disciplines.